Jennifer Pendergast moves all in and Stan Matsumoto (above) flips in a chip to signify a call. It is a AK v. QQ flip, and an Ace in the window holds for Pendergast to get her double. Matsumoto is one of a number of deaf players who comes to Thunder Valley for poker tournaments. 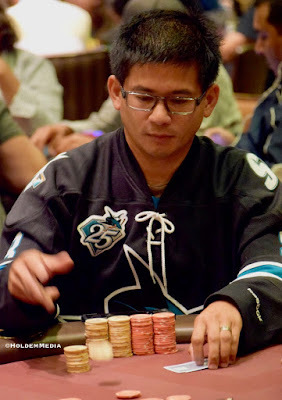 Lay Saelee, another TVPokerRoom regular, ran deep in last year's Ante Up series and Matsumoto, from Fremont, is making his run today.